The Rencontres de Moriond session on Cosmology will review the subject 2 years after the last edition. 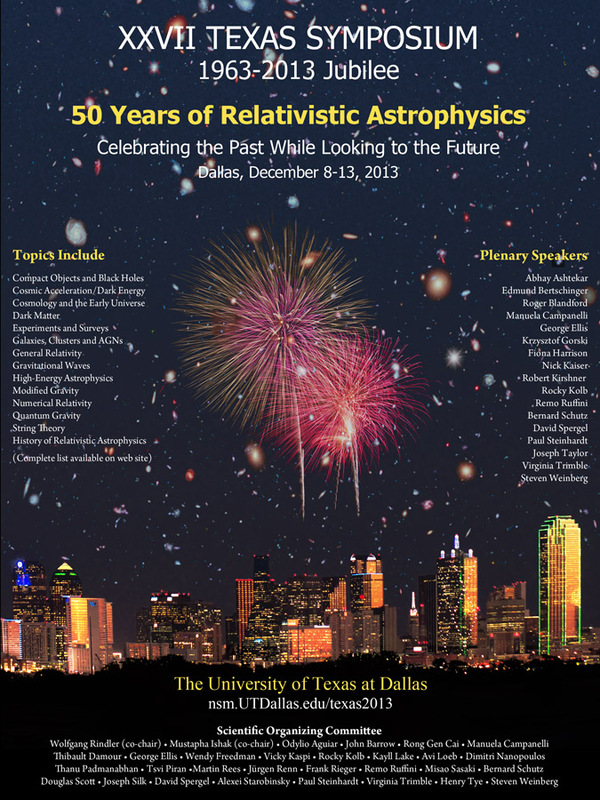 The 27th Texas Symposium on Relativistic Astrophysics will be held in downtown Dallas December 8 – 13, 2013. It is organized by the Department of Physics at The University of Texas at Dallas (UTD) and is chaired by Wolfgang Rindler and Mustapha Ishak. The Symposium will include both invited and contributed talks and posters. This will be a special and historically meaningful Jubilee meeting, marking the 50th anniversary, almost to the day, of the very first of these Texas Symposia, held in Dallas in December 1963. We are excited to welcome hundreds of international astrophysicists back to Dallas fifty years later, both to celebrate the past 50 years of Texas Symposia and relativistic astrophysics and to kick off the next 50 years of remarkable discoveries. The Rencontres du Vietnam on Cosmology in the Planck Era will review the most recent status of the field. The conference will consist of plenary sessions for invited indepth oral presentations (review talks and talks on specific specialised topics), and contributed papers, in the form of relatively short oral papers (sollicitated or selected from abstract submission). Special emphasis is being placed on active participation by young researchers and post-docs. Did the Milky Way and Andromeda already collide? Gli scienziati ritengono che tra circa 3 miliardi di anni la Via Lattea si scontrerà con Andromeda e che tale evento sarà il primo di una serie di collisioni galattiche. Oggi, però, un gruppo di astronomi guidati da Hongsheng Zhao della University of St Andrews propone un nuovo scenario in cui viene ipotizzato che le due galassie si sono già scontrate una volta, circa 10 miliardi di anni fa, e che la nostra conoscenze sulla gravità sono fondamentalmente errate. In realtà, questa idea potrebbe spiegare non solo la struttura della nostra galassia e quella di Andromeda ma anche la presenza delle galassie satelliti. The Milky Way, made up of about 200 billion stars, is part of a group of galaxies called the Local Group. Astrophysicists often theorise that most of the mass of the Local Group is invisible, made of so-called dark matter. Most cosmologists believe that across the whole Universe, this matter outweighs ‘normal’ matter by a factor of five. The dark matter in both Andromeda and the Milky Way then makes the gravitational pull between the two galaxies strong enough to overcome the expansion of the cosmos, so that they are now moving towards each other at around 100 km per second, heading for a collision 3 billion years in the future. But this model is based on the conventional model of gravity devised by Newton and modified by Einstein a century ago, and it struggles to explain some properties of the galaxies we see around us. Zhao and his team argue that at present the only way to successfully predict the total gravitational pull of any galaxy or small galaxy group, before measuring the motion of stars and gas in it, is to make use of a model first proposed by Prof. Mordehai Milgrom of the Weizmann Institute in Israel in 1983. This modified gravity theory (Modified Newtonian Dynamics or MOND) describes how gravity behaves differently on the largest scales, diverging from the predictions made by Newton and Einstein. Zhao and his colleagues have for the first time used this theory to calculate the motion of Local Group galaxies. Their work suggests that the Milky Way and Andromeda galaxies had a close encounter about 10 billion years ago. If gravity conforms to the conventional model on the largest scales then taking into account the supposed additional pull of dark matter, the two galaxies would have merged. “Dark matter would work like honey: in a close encounter, the Milky Way and Andromeda would get stuck together, figuratively speaking“, says team member Prof. Pavel Kroupa from Bonn University. “But if Milgrom’s theory is right“, says his colleague Benoit Famaey (Observatoire Astronomique de Strasbourg), “then there are no dark particles and the two large galaxies could have simply passed each other thereby drawing matter from each other into long thin tidal arms“. New little galaxies would then form in these arms, a process often observed in the present-day Universe. Zhao explains: “The only way to explain how the two galaxies could come close to each other without merging is if dark matter isn’t there. Observational evidence for a past close encounter would then strongly support the Milgromian theory of gravity”. Just such a signature might already have been found. Astronomers struggle to account for the distribution of dwarf galaxies in orbit around both the Milky Way and Andromeda. The dwarf galaxies could be explained if they were born from gas and stars ripped out of the two parent galaxies during their close encounter. Pavel Kroupa sees this as the ‘smoking gun’ for the collision. “Given the arrangement and motion of the dwarf galaxies, I can’t see how any other explanation works”, he comments. The team now plan to model the encounter using Milgromian dynamics and are developing a computer code at Bonn University for this purpose. In the new model, the Milky Way and Andromeda are still going to crash into each other again in the next few billion years, but it will feel like ‘deja vu’. And the team believes that their discovery has profound consequences for our current understanding of the Universe. Pavel Kroupa concludes, “If we are right, the history of the cosmos will have to be rewritten from scratch”. RAS: Did Andromeda crash into the Milky Way 10 billion years ago? The 20th International Conference on General Relativity and Gravitation (GR20) and the 10th Amaldi Conference on Gravitational Waves (Amaldi10) will take place from 7th – 13th July 2013 at Uniwersytet Warszawski, Warsaw, Poland. GR20 is the latest in the series of triennial international conferences held under the auspices of the International Society on General Relativity and Gravitation. This conference series constitutes the principal international meetings for scientists working in all the areas of relativity and gravitation. The Amaldi conferences are held under the auspices of the Gravitational Wave International Committee. Since 1997, they have been held every two years and are regarded as the most important international conferences for the gravitational wave detection community. This time, in Warsaw, GR20 and Amaldi10 are organized as a joint event. The program of the conference, among many topics, includes: Planck Results, Dark Energy, Formation of the Trapped Surfaces, Dynamics of Asymptotically AdS spacetimes, Gravity and Condensed Matter Correspondence, Numerical Relativity and Its Applications to Astrophysics and High Energy Physics, Neutron Stars, Formation of Supermassive Black Holes, Modified Gravity as Alternatives to Dark Energy or Dark Matter, Cold Atoms for Equivalence Principle Tests and GW Detection, Quantum Fields in Curved Space-time, Higher-Dimensional Spacetimes, Loop Quantum Gravity, Strings and Branes.